Yes, it’s still a far way to go. I should stow my photography gear back in my rucksack and hike a bit faster. The left peak, the Wartherhorn is my destination. The bigger mountain in the center is the Karhorn which was originally my goal, but because of the bad weather I will go to the smaller one on the left. Wich means, I should go now. By the way, you can see the cables of the funiculars for the daylight tourists? But now, I’m the only person here, up between the mountains. Okay, not that hard and probably it was anyway my fault. After I took the last image, I missed the right way and walked an extra tour. Actually I had to know where to go, because it was the same way I took with Bubu two days earlier in the other direction down to the valley. But however, this gaves me the chance to take this image of the mountain I hiked the afternoon before. On the other hand I was now late and I had to hurry, not to miss the sunrise on the peak. Every night around eleven o’clock, they are coming over our home village. It’s the time, when I go for the last walk with Bubu the dog, first I hear it and then short after, they are thundering directly over my head, on their way to a far away destination. And they are so deep, I can see all the details on the planes and they are using the landing light all the time until I can’t see theme anymore in the sky. So how to get an image of this planes? Planning is everything and I thought, it could be looking good, if the landscape is lighted by the moon and when is more light from the moon as in a fullmoon night? And it should also be a clear night, so I can see the stars and the planes. So the time comes, when everything was right and I left my home and hiked to the nearly hill for a good overview. Okay, some parts are not as expected. The planes are not flying directly over the village and they are much higher as I thought. Also the moon was coming over the horizon, short before the planes were coming, so two days earlier would be more light. But on the other hand I have more sunset like, long shadows. Because I shoot this image in June, the sun setted not long ago and we can see last glow at the horizon and not only the light pollution. Bring some movement into the image. As I told you, after our trip around the pond until we found it, there were already two photographers at the secret place. Well after we chatted and shooted for a while, they decided it’s time to unpack some fireworks for enhanced nightshots. And after a few tries, I had also a nice image on my card. Okay in fact, this image is made of 7 shots. Three for the foreground, three for the stars and one for the steel wool acrobat. Because of the different light situations I needed for each part different exposure times. 60 seconds for the foreground, 25 seeconds for the stars, so we don’t have stripes and because the steel wool was so bright, I took it with 3 seconds and 800 ISO instead of 3200 ISO. 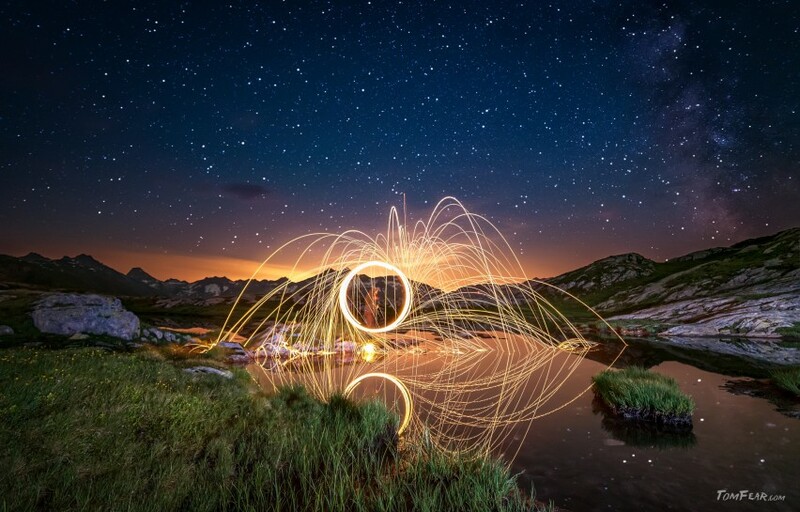 At this point a special thank to the other guys, to bring steel wool to the nightly alps. This is light pollution and not the rising sun. Often the people congratulates me to shoot such an intense sunrise or sunset. But I can tell you, if the sunlight would still be visible at the horizon, you wouldn’t see the milkyway. To say it clear; if you see an image with the milkyway and a sunset glow at the horizon, it is surly a composition. It is also not possible to get an image of the milkyway, if the moon is shining. Maybe you can see a gleam of our galaxy but surly not more. 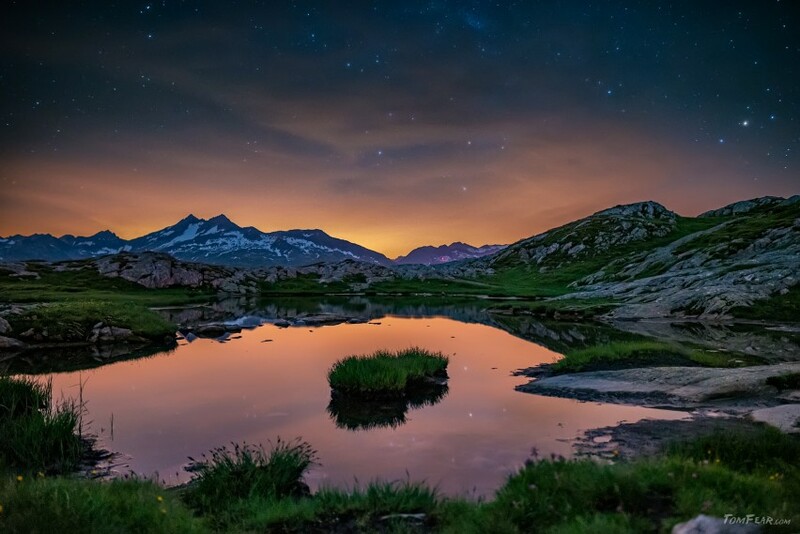 What you can see on this image is the light pollution from Italy which comes over the alps. And because of the rest of the clouds on the horizon, it glows so intense. 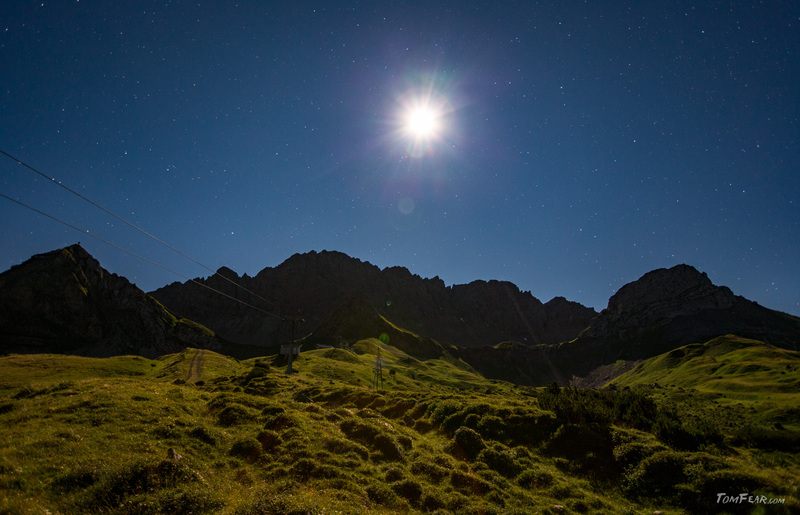 In central europe is nearly no place anymore where you don’t have a strong light pollution. 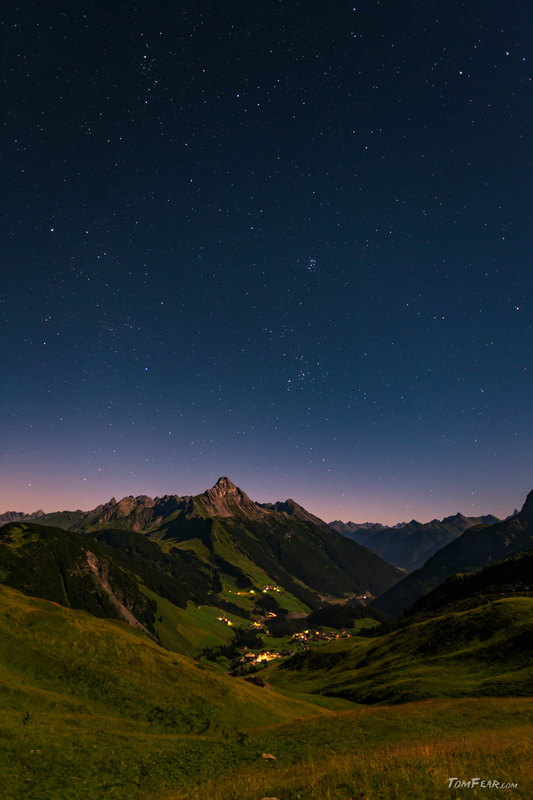 Even here in the middle of the alps over 2200m you still can see the city lights of the towns and villages. But as you can see, light pollution doesn’t have to be bad in all cases. Because you will get this nice orange glow as a contrast to the green and blue tones of the nature. 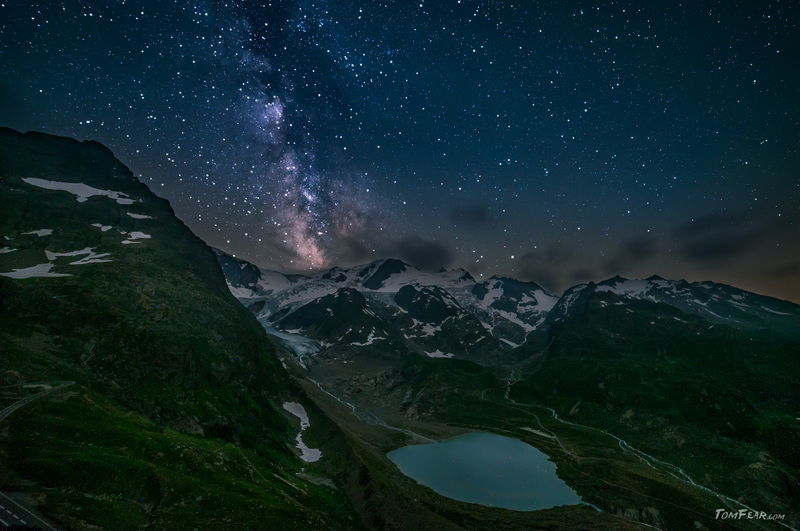 On the other hand, more milkyway you wont see in Europe, if you want to see more of it, then you have to take a plane. 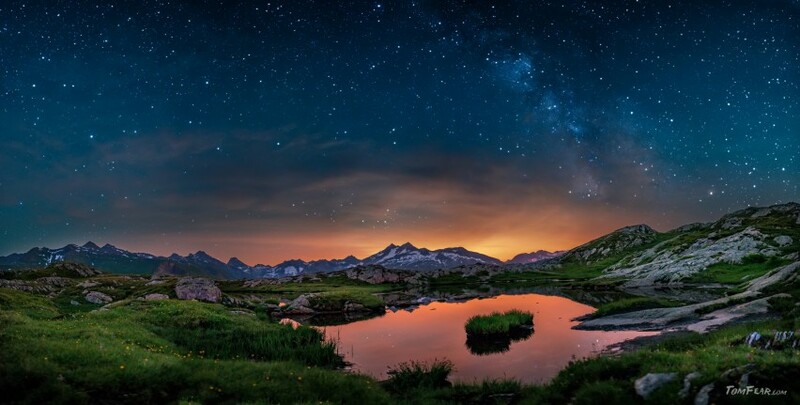 Yes, you can see the milkyway mirrored in the pond. After I turned my position to my left, the far mountains are no more visible in the mirror of the lake. But therefore I could see the beauty of the milkyway. 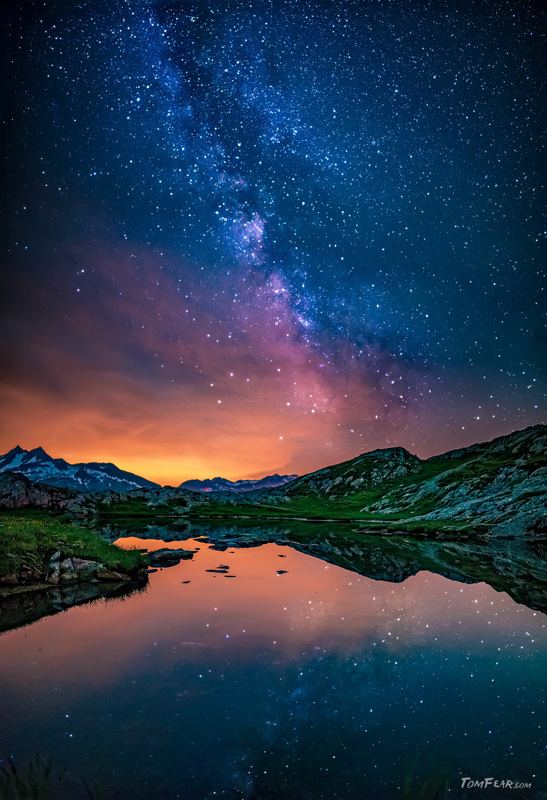 And with a closer look, you will see the mirror of the milkyway in the water. This is realy nice not even I could see the milkyway but I could also see it in the water of the pond. For this image I need to take eight shots to catch not only the mirror lake, but also the milkyway in the sky. 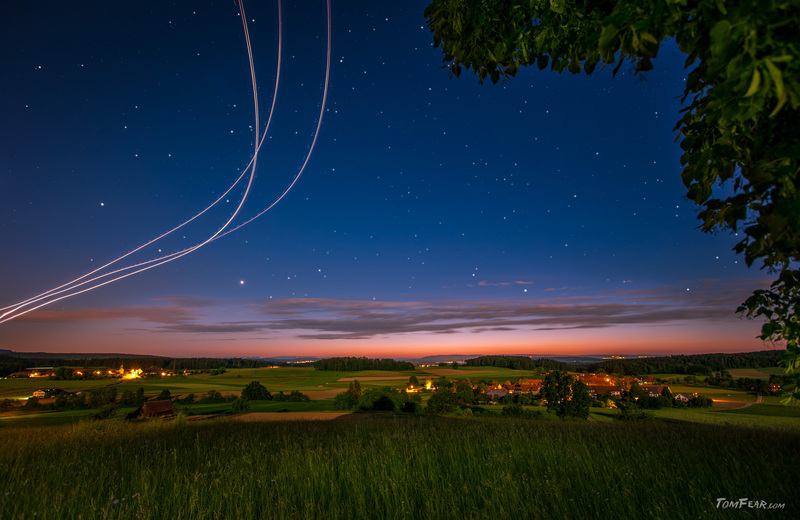 I took four images with 8 seconds and four images with 30 seconds for a brighter foreground. The lake behind us and where we came from. As you know, we were walking about an hour until we found the pond behind me. And as you can see, the way was not so far, if we read the map and walked along the hiking path, before we decided to walk in a straight line “directly” to the pond. But it was anyway a nice evening and night and it gives me a good story to tell. On this image you can see the top of the Grimselpass with the lake called Deadlake, maybe it’s a deadly one, who knows This is an HDR pano made of 16 images two times four images and with two different exposure times each. When I called my friend Koni, whether he want to come to the mountains for a short trip at friday night. 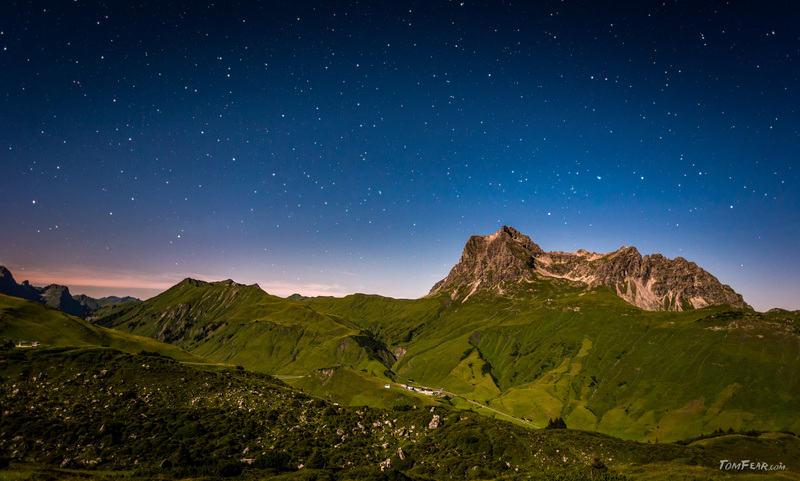 I mean other guys are going out for a beer, meeting friends in the bars, but we decided to drive up to the alps for a nice photo night. We meet us half way at a shopping mall, so we can share one car and while we parked one car, it rains like hell. Okay that starts already well… But we are tough men and so we drove ahead up to the grimsel pass. It was the idea of Koni to go there, because he knows that secret spot with a small alpine like, where the mountains are mirrored in. Because of the rain and the traffic, we reached our destination, as usual, too late and it was already dark. But we are real men and as mountaineers as we are, we walked from the parking lot straight ahead through the meadow and over some hills to this secret lake. Koni knows where to go, he was already there and has a lot of experience in the mountains. And so I walked after him and we talked about the nice images we will do in a few minutes. After half an hour or so, he was no more so sure, where this lake was and in his mind, it was much nearer as we walked already. After another ten minutes I took out my smartphone and asked the GPS-map where we are and where the pond is. And what a surprise, the pond was not far away from car but we where not close by. Okay, with the help of the map we walked offroad across the meadow back to the place where it should be. Now, we were really late and it was close to midnight now, but the good thing was, the sky was as good as clear now. And after few minutes I could recognize a small red dot in front of me and a bit later some white beams of headlamps. Hmm, there were already some photographers at work at his secret place in the middle of nowhere, near the parking lot. All the sunlight is gone and all the starlight was visible. Okay, I promise you, this is the last image of this lake. Not all clouds were gone but I could see the milkyway above the glacier. For this image I tried something special. I made this image with the Sony A7s, my low light king. But I used a technique which I developed for my Canon 6D. I used an additional a star guiding tool, the nano.tracker, for the possibility to become an exposure time of 120 seconds without any startrails. This was my best technique to get images without so much noise. Because of the long exposure time, I could screw down my ISOs. And what now happend is interessting, although the A7s is so good with high ISOs, it is very bad for long exposures. If you look closely, you will see all the red, blue and green dots of the hot pixels. With the Canon I was getting also some hot pixels, maybe five or ten, but this, there must be about one hundert of them. The conclusion of this, every camera body has it’s pros and cons.